This collection contains the California Open Educational Resources Council (CA OER) list of peer-reviewed textbooks for Introduction to Mass Communications (common course-id JOUR 100), one of the top 50 college courses identified for inclusion in the California Open Online Library for Education (COOLforEd). Survey of mass communication and the interrelationships of media with society including history, structure and trends in a digital age. Discussion of theories and effects, economics, technology, law and ethics, global media, media literacy, and social issues, including gender and cultural diversity. Elements of Mass Communication is a free online open textbook This interactive cybertext is authored by Ron Whittaker, Ph.D. This book is in the form of a Wikibook. Each chapter features multiple sections related to its topic and contains a chapter review, definition of terms, and extensive references for further exploration of the topic. 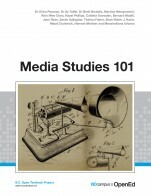 Media Studies 101 is the open educational resource for media studies in New Zealand, Australia, and Pacifica. We have constructed this text so it can be read in a number of ways. You may wish to follow the structured order of chapters like you would in a traditional printed textbook. Each section builds on and refers back to previous sections to build up your knowledge and skills. Alternatively, you may want to go straight to the section you are interested in -- links will help guide you back to definitions and key ideas if you need to refresh your knowledge or understand a new concept. Understanding Media and Culture: An Introduction to Mass Communication was written to squarely emphasize media technology. Jack believes that an introduction to mass communication text should be a compelling, historical narrative sketching the ongoing evolution of media technology and how that technology shapes and is shaped by culture — and that is what he set out to deliver with his new textbook. Students today are immersed in media technology. They live in a world of cell phones, smartphones, video games, iPods, laptops, Facebook, Twitter, FourSquare, and more. They fully expect that new technology will be developed tomorrow. Yet students often lack an historical perspective on media technology. They lack knowledge of the social, political and economic forces that shape media technology. This is not knowledge for knowledge’s sake. It is knowledge that can help them understand, comprehend, appreciate, anticipate, shape and control media technology.